The oldest directly dated human remains in the Americas were recovered by University of Oregon's own Dennis Jenkins, PhD./Archaeologist in Paisley. Now Dr.Jenkins is presenting his latest investigations from this past summer in the Connley Caves. Be sure to catch his talk this Friday, October 16 from 7:00-8:30 PM at the Welcome Center yurt. Your $5 parking pass is your admission. Dr. Jenkins at Paisley Cave with bison bone. Photo courtesy of Dennis Jenkins. 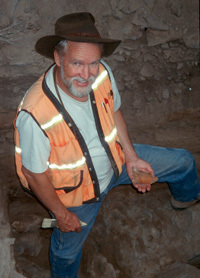 From his bio at the U of O Archaeological Field School: Jenkins has authored and co-authored 8 books, 44 chapters, journal articles, reviews, and published papers, 33 major professional reports, and given 62 professional papers and symposia at conferences. His doctoral thesis, Site Structure and Chronology of 37 Lake Mojave and Pinto Assemblages from Two Large Multicomponent Sites in the Central Mojave Desert, Southern California, was the culmination of four years of research focus on the late Pleistocene and early Holocene archaeology of the Mojave Desert as the Field Director of the Fort Irwin Archaeological Project near Barstow, California. Through the UO field school he has conducted new excavations at the famous Connley Caves and Paisley 5 Mile Point Caves sites, recovering the oldest directly dated human remains—12,400 RCYBP mitochondrial DNA in human coprolites—in the Americas from the Paisley Caves (Gilbert et al. 2008; Jenkins 2007; Jenkins et al. 2012, 2013). Connley Caves photo courtesy of Justin A. Holcomb.